STX Infuzium 420 is a fully automatic, economical and ecologically friendly herbal botanical butter infuser and extractor machine with a solid and durable design, an MCP- Maximum Capacity Performance thermostat and an LED display panel. You shall get the complete kit of two purifier filters (73 and 190), a silicone glove, 100% silicone butter mold, 100% silicone kitchen mitt and the Infuzium 420 All Inclusive Cookbook with more than 80 recipes and tips and the fully illustrated instructions to make your life easier. As one of the best selling herbal infusers at Amazon.com, it is rated 4.8 out 5 stars by 21 customers. 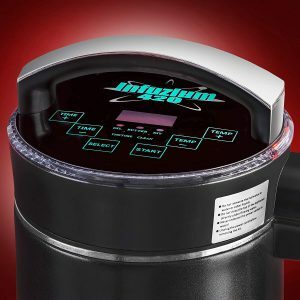 The Infuzium 420 is economically designed lets you to do different size batches with the MCP thermostat between 1 and 4 cups (2 sticks- mini batch to 8 sticks- full batch) of butter. You can start experimenting with the herbal infusions or extractions by a small amount of herbal investment at first. It has a cutting edge microprocessor and the LED-backlit digital display panel that make the unit easy to operate and precisely. The display panel is easy to operate and includes the Start, Stop, Time +, Time -, Temp +, Temp – and Select touch buttons and Oil, Butter, DIY, Tincture and Clean indicators. You can experiment with your own DIY settings or use one of the five preset settings (Oil-1 hour, Butter- 2 hours, Tincture- 4 hours, DIY- 1.5 hours, and Clean- 2 mins). The preset times on the preset settings can also be customized- adjusted between half an hour to 12 hours in 5 min increments. You can expect strength, high performance and insulation from its double wall and 304 stainless steel main unit with a slip-resistant powder coated exterior- premium construction and engineering. 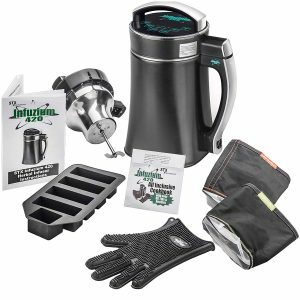 You can extract herbal oils, herbal butter, alcohol, tinctures, make nut milks from different types of nuts, puree soups and more with the Infuzium 420. With the advanced microprocessor, the Infuzium 420 automatically, reliably and consistently mills, blends, heats and steeps at just the right temperatures and in the right order to achieve the best results. The STX Infuzium 420 weighs 8 pounds and measures 7 x 8.2 x 12.5 inches. It has an 800W heating unit (110/120 Volt – 60 Hz), 15,000 rpm mixer, DIY and self-cleaning functions, overheating automatic shut-off, boil dry protection and proves to be user-friendly, sturdy and durable and safe to use. The powder coated canister exterior allows the best heat retention and the max grip when the extractor unit is cool. Decarboxylation can be done easily in your oven before starting the infusion/extraction process. You can use the raw cacao butter, coconut butter, solid fruits and veggies as the machine will heat up and melt the butters before starting the blending. You rinse the filters with warm water and dish soap after use and let them air dry. The thermometer is located at the bottom of the unit and this makes it easier to do the smaller or larger batches. The STX Infizium 420 is a great quality and versatile product with user-friendly features and a sturdy construction, offered at a fair price. This product comes with a generous 3-year warranty that includes the cost of labor and parts as well as the 30-day unconditional money-back guarantee. We do not hesitate to recommend it.